I did it! I'm up at 5:00 am and actually on the bike by 5:50 am. After ten minutes I stop for chai and a few ring-rolls at a roadside cart, then follow the well-marked road toward Aksaray. It feels like this is going to be a good day. I plow on and make a point to stop for chai regularly. Looks like I'll make my 100 k by 1:00 pm. At one of the chai stops I act-out the earlier dog attack, and the three men in the mini-market laugh at my story. Then the owner reaches behind the counter and hands me a very large firecracker. I laugh, and thank him. I'm not sure how I'm supposed to light this while bicycling away from vicious dogs, but I add it to my inventory of defensive devices. I stop for a nice truck-stop lunch at 12:30, just a few kilometers short of my destination, Sultanhani. I ask about accommodations and am told about a pension. A phone call is made and I'm told to wait. After a few minutes just sitting there, I break away and continue riding. A motorbike passes me from another direction, loops around and catches up. "Pension?" he asks. "Yes," I reply. "How far?" I add. He replies, "Come!" I follow him: my bicycle behind his motorbike, and within minute or two we pass a turnoff, and signage indicating Sultanhani's Centrum. I continue another half kilometer following the motorcycle, then break away. I head back toward the turnoff. I have no use for an address that's not near anything-especially as I haven't seen what accommodations are near the old fort. I turn up the side road, and there, about a half-kilometer up, is the fortress. It looks sort of like the Alamo, in Texas. It's nice enough, and apparently packed with history, the setting is a bit off, as the immediate area is crowded with tea gardens and another tourist-related businesses. It's not bad, but it's not amazing. I bike past it, for a quick scan of the town, note plenty of pension and camping signs, but no hotel signs. I U-turn back to the fort, park the bike, go in and take a few pictures. As I leave the fort, I spot a hotel sign, but it's already too late. 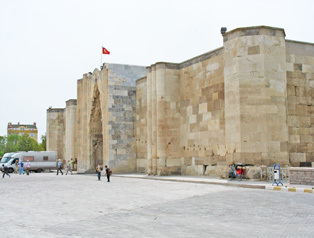 I've decided to bicycle the next 40 k and make it to Aksaray. There's been no wind problem and I really can't see keeping busy in this town. Ahmet was right about this. He said Sultanhani was good for 30 minutes. Further on, at a chai stop, I asked about hotels in Aksaray, and told about a nice one on the freeway and another nice one in town. As I approach Aksaray (the sign says population equals 110,000), I do see a nice hotel at the side of the highway. Then I see two more hotels at the side of the highway. I break off and head to "Sehir Merkezi" - the Center - and eventually find a tourist office where I get a map of downtown, showing three downtown hotels. 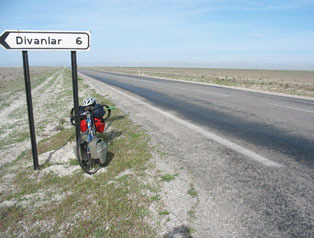 My bearings are off, but I find one of them by luck, but decide not to pay 40 Turkish Lira for this rather bland address. I visit a second hotel and accept the 30 TL offer. 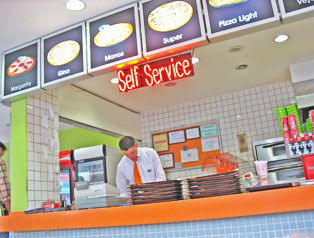 I visit an internet café, have a pizza/chicken/French fries combo from a fast food chain, and wander around town. It's starting to sprinkle, so I will have to play this by ear. It's a flat run to Sultanhani. 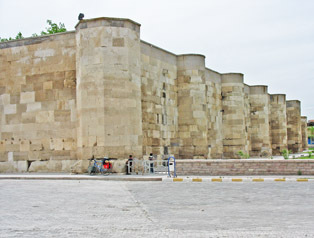 Sultanhani: One of the Silk Road fortresses / rest stops. The fort is nice, but not worth an overnight stay. 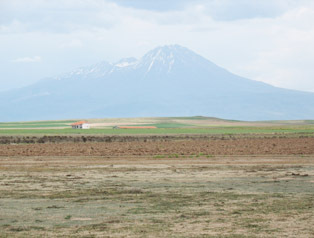 A volcano somewhere east of Sultanhani. Fast-food pizza was just what I needed!